Written by Lachlan Rowbottom, Limestone Coast Pantry. My fondest memories growing up revolved around food, happy times spent with my siblings climbing trees, camping in the bush, and eating mum’s home cooked meals, delicious experiments or growing our own vegetables and herbs. The passion my mum has for food, has always been normal for us, and it seemed inevitable that one of us would want to join her on her journey. 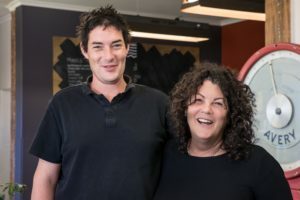 Being passionate about where our food comes from, how far it has travelled, how sustainably it can be sourced and supporting our local community of food producers has been our goal in business and in opening the Limestone Coast Pantry. To guarantee the freshest & most nutrient dense food we can possibly source, we didn’t need to look very far, we have an abundance of local food producers on our doorstep from organic garlic, apples, eggs, vineyards, to the most fabulous wagyu beef, and organic grains grown an hour away from our premises. We live in an area of South East South Australia that is known for our fresh air, clean limestone filtered water and rich volcanic soil that all combine to produce some of the best quality and most delicious food in Australia. I had the love and passion for locally sourced, meticulously showcased food, but needed the business skills to manage our new venture, which is what led me to Innovative Business Training (IBT). Starting a new business from scratch, I was time-poor, and needed a training solution that I could fit into my daily schedule, a course that would be able to teach me new operational and administrative skills along with business tools I could use at a pace that suited my needs and using methods I could easily grasp. I was hesitant before beginning my course about how I would be able to study and succeed in regional South Australia without attending a training premises, but IBT offered flexibility with how I studied and the blended mode of delivery was perfect for the way I learn and my busy schedule. The personal mentoring was invaluable to me, and I was able to continue setting up our business, putting my newly learned skills to use straight away, with help and support only a phone call or email away. We were thrilled to welcome IBT Director, Wendy Tagliabue into the Limestone Coast Pantry for a work site visit where she offered relevant and welcomed advice on refining what I had been learning to directly relate it back to our business. In my management role, I’m responsible for staff training which previously would have terrified me, but I’m surprised with just how effectively I have used my new skills learnt through IBT to provide training for our staff, and with a new-found confidence in my skills as a trainer, there’s no stopping me now in pursuing excellence both in our business and my personal life. I love how up to date and relevant all the units of study are to our business, touching on everything from e-business tools, to finance, keeping records, workplace health and safety to sustainability and many more. I was so glad we chose IBT to deliver our business training. Thank you to Wendy and all the IBT trainers for your guidance, your commitment to mentoring students and the professional, flexible and relevant way you conduct your training. Learn more and register your interest here http://www.innovativebusinesstraining.edu.au/enquire/ and the team will get back to you!